In my many years of dabbling with computers, one good idea I’ve come up with is to take photos of your hardware. Because you might be browsing for a new sound card at the stores but can’t remember if you have any available PCI slot to use. You might come across an article one day that claims that a batch of SSDs are faulty, and you end up having to open up your PC to find out the serial number of your SSD to see if you’re affected. Keep them stored on your phone and dropbox so it’s easily accessible. A folder of links to your hardware’s details on their manufacturer’s website is useful to keep too. So you can easily check for any new BIOS updates or look up specs. Digital copies of receipts and warranties too! In case something spoils and you want to know as soon as possible if it’s still covered under warranty. And to save yourself from turning your house upside down to find the receipt of your purchase made years ago, always keep them securely together in a folder at a fixed location. In my current office, most Mondays, we always come to work to find out that something had broke. The other day, the thumb-scanning device that opens the door when authorized people scan their thumbs, froze and half the company were stuck outside. It was probably the thunderstorms that occured throughout Singapore earlier that morning. We had to buy screwdrivers from the nearby hardware store, open up the device, disconnect and reconnect the power supply to restart it. On another Monday morning, we came in to find no power supply for everyone in the first floor. The circuit breaker had tripped. But even when we switched off all the devices, the breaker will still trip. Turned out to be faulty electrical cables somewhere. A long while ago, a glass door in the 3rd floor fell on it’s own. I didn’t check out the scene so don’t know why. Today, a Monday, I plug my laptop into the power socket on my desk and the power supply for my cubicle went out. Circuit breaker didn’t trip. Turns out the power socket on the floor somehow got damaged and had to be replaced. … but their latest Lion OS has me convinced that they’re worth considering. I named it Prishe. Still looking for a pretty wallpaper of Prishe! And this runs on SSD too! With up to 7 hours of battery life! My current Dell m301z laptop boasts of 5 hours of battery life but the most I could ever squeeze out of it is 2.5 hours. I once tried to update the BIOS for m301z and it resulted in an unbootable laptop. I had to go through a long phonecall and process before they would send someone down to me and replace the motherboard. There’s a problem transferring data to my portable USB harddisk, it slows down to a crawl. I’m afraid of updating to the latest BIOS because of what happened. Then recently, I started exploring the Linux world and found it pretty productive. Things like running find and sed as a single command (piping) to search and replace text in a config file for 20+ websites. Using grep to search for .php files infected with malicious iframe scripts. And since Mac OS X is built on Linux, why not get one in order to learn more command line stuff? It’s a good thing I waited till Lion got released. Because back then when I wanted to get a MacBook Air, there wasn’t any mention of a new series using the i5 CPUs. 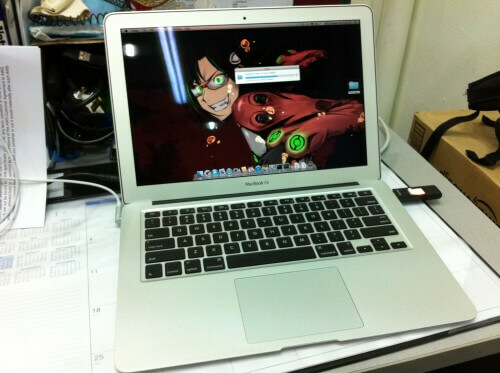 So when the new i5 MacBook Airs started going on sale in Apple’s online store for Singapore, I snapped one up immediately. When the DHL guy delivered it to me, I opened the box, took out the actual MacBook Air box and held it high with my left hand and played the Zelda “item get” / “item fanfare” sound from my phone with my right hand. It just had to be done. I’ll post an update again after a few months of use. If you want to feel despair about living in Singapore, check out Stomp. Stomp is like a public shaming website where people take pictures of other misbehaving people and post them to this website to shame them. It’s not the misbehaving people that gives me despair. It’s the people who post those pictures. In their attempt to feel the thrill of having their pictures posted online for thousands to see, they take pictures of very minor offences in action.